I am thinking of replacing "who" with "nobody." I think it would make more sense in english. It is the definition of an after-life that screams into the sky! Cutting through bone slay the darkness! Okay 徒花/adabana means a Flower that does not bear fruit. I can't seem to find any english equivalent word, and putting "non-fruit bearing flower" or "fruitless flower" doesn't sound very good to me. However, of the many meaning of 徒, one is futile. To me, at least, that sounds much better and seems to suggest the meaning (a flower that doesn't bear fruit seems futile). So I am considering rewording this Moan futile flower. Of course, if anyone thinks that would be bad, I will keep it as "fruitless flower." I have my doubts about "release hunger." What does that have to do with having your dignity ridiculed? "call out with life that you will run even if you die,"
But that didn't sound right to me. It's a saga that blooms unseasonably throughout the whole world." "It is the rebellions chance to succeed that shines in the rift between the clouds"
and "thrust resolution to fate" doesn't sound right. Maybe "leave readiness to fate" instead? throw away your will, your freedom, and your body"
of this deceased pulsating world. Open your eyes in order to see and bare your fangs! Open your eyes in order to see, and bare your fangs! From my understanding, 修羅花 can mean either Azura Flower or Carnage Flower. Given the rest of the song I went with Carnage. I translated this as favorite idol. I think Image/Idol is acting as a modifier more than a possessive however the way I combined the two (image/idol and favorite child) doesn't feel quite correct. Since this is an anime about Idols I went with favorite idol. The last line drove me nuts. It seems to be saying as for my to my eye, peel open my eyes. I took that to mean "open your eyes in order to see." However that ends in the ren'youkei of 剥く. I took that as a conjunction but normally wouldn't that be in the て form? In that form wouldn't it normally be a combination word between peel and fang? Maybe bared fang? But if so then it would be "bare your bared fangs?" and the beginning would be "an eye for an eye?" I feel like this is right but I also feel like I am missing something. 捨て石 means sacrifical stone in a game of Go (or ornamental garden stone), but I thought saying sacrifical pawn would make more sense in english. I have listened a few dozen times at 2:30 time. I can't be sure that the transliteration of "ranse ni hotobashiru saga" is correct. They are just singing too fast for me. I am just trusting that my reading of the Kanji is correct. We are not allowed to judge. The last line seems to be saying to be made/allowed to cut through bone and then a command to slay darkness. Dash through the wastelands! Challenge troubled times! Alright. Any criticism, suggestion, or corrections? Last edited by Lost247365; 12-22-2018 at 06:05 AM. Reason: One day I will learn to proof-read. Today is not that day. I think "静寂（しじま）を破り芽吹いた" is a single phrase modifying 夢--"A dream that sprouted, breaking the silence," or something along those lines. Re: 徒花, I actually like "fruitless flower." "Fruitless" can actually mean "futile" in English too, so I think it keeps both the literal and metaphorical meanings pretty well. I think it's more like "let loose your hunger" or "unleash your hunger" (on those who ridicule your dignity). I haven't seen this series, so I don't know if the zombies in it have a literal hunger for human flesh or anything like that, but my first thought was that it was something along those lines--that the character(s) being addressed has/have, if not a literal hunger, at least a metaphorical bloodlust that's usually repressed, which the song is saying to give free rein in this particular kind of situation. XをYと呼ぶ usually means "to call X 'Y'"/"X is called 'Y'." So this is like "Keeping running even if you die is called 'life'", which is a very inelegant way of phrasing it that I don't recommend you copy as is, but you get the idea, I hope. I might phrase it as "Life is keeping running even if you die" or something like that, although I really want a better phrasing for the 枯れても走ること part. In other contexts I might interpret "枯れても走る" as "running even though it might kill you/lead to your death," but since, you know, zombies, I suspect this might literally mean that although they've technically died, they're still going, and that's a kind of life--which, I think, makes that line the 脱・生存の定義 that the next line references. Also, I think the 脱・生存の定義 is being shouted into the sky rather than doing the shouting itself. This seems to be based on the saying "肉を切らせて骨を断て," which is like "Cut through [your opponent's] bone even if it means that [your own] flesh is cut." Basically, it's saying it shouldn't matter to you what damage is done to you as long as you can do more damage to your enemy. Saying to cut through the darkness even if your own bone is cut I think both implies that cutting through the darkness is an extremely important thing to do--such that you should be willing to sustain even more grievous injury in pursuit of that than the "cut flesh" of the original saying--and that, well, not to keep going on about this, but they are zombies, so they can presumably, uh, "survive" injuries more severe than a human could. "thrust resolution to fate" doesn't sound right. Maybe "leave readiness to fate" instead? It's tempting to interpret it that way, but it reads more to me like readiness is a weapon with which fate is, metaphorically, being stabbed. Maybe the defiance of/attack on fate is the 簒奪? I do like "It is the rebellion's chance to succeed that shines in the rift between the clouds". I would interpret 天下に狂い咲く　サガ as something like "It's a saga that blooms unseasonably throughout the whole world." I think "傷ひとつ無い 手など愚か" ends in an implied "です," making it a complete sentence and not an unfinished clause just kind of hanging out there the way you currently have it (not that Japanese songs don't often have unfinished clauses just kind of hanging out there). So something like "It's absurd to have a hand without a single scratch". I also think "意思も自由もその身" is a list of things to which 投げて applies--"throw away your will and your freedom and your body". I'm tempted to apply 鼓動亡き世界で to the line before it--"Burn, carnage flower / In this 鼓動亡き world." As for 鼓動亡き, I would treat it as a play on 鼓動無き. 鼓動 often refers to a heartbeat, so saying 鼓動亡き is kind of saying "heartbeatless" and then emphasizing that that means "dead." I might just say "lifeless world," personally. Note that it's 心を無くすことが死（おわり）と知れ , it's not a の there. Imagine an implied だ after おわり if that helps you make sense of the grammar. I think you're right to use "idol" in this line. Note that 寵児 doesn't just mean "favorite child," but also "hero" or "star"... or "idol." :P So basically, there's more wordplay going on here, in that they're referring to idols in the music sense with two words that both more or less mean idol, but in different senses (neither of which is "idol singer", which is アイドル). If this were my translation, I might drop the "favorite" and just say "idol," but I would probably include an explanatory footnote. In 極めど儚い, -めど is an archaic verb form that's like adding けど after the verb. So it's like... "though idols may be masters of their craft ((which I think is the sense in which 極める is used here)), they're transient". However that ends in the ren'youkei of 剥く. I took that as a conjunction but normally wouldn't that be in the て form? No, this form can be conjunctive as well. You can see this construction also in the earlier "静寂（しじま）を破り　芽吹いた夢を" line. So your current translation is fine, I think. いつか is not "sometimes (everyone is...)," but "someday (everyone will be...)," which I know sounds like a tiny distinction, but the difference in meaning is pretty significant. "Sacrificial pawn" is good, I think. 乱世 is read "ransei" and since "ranse" isn't, to the best of my knowledge, a standard/accepted variant, I think it should be "ransei" even if it sounds like the vowel is short because they're singing fast. My interpretation of the structure of the previous "saga" line also applies here. I'd take 打ち鳴らせ as a command--"make/let hope ring out loudly." You're right, though, that the 希望 is the 証.
I know my constant refrain is usually "these phrases aren't separate," but for once, I think these phrases are separate--"I run through the wasteland [and] challenge the troubled times." Last edited by bluepenguin; 12-18-2018 at 01:44 PM. That said, I was a bit burnt out and am taking it easy for the holidays. That is what I thought but I guess the way I translated wasn't very good. 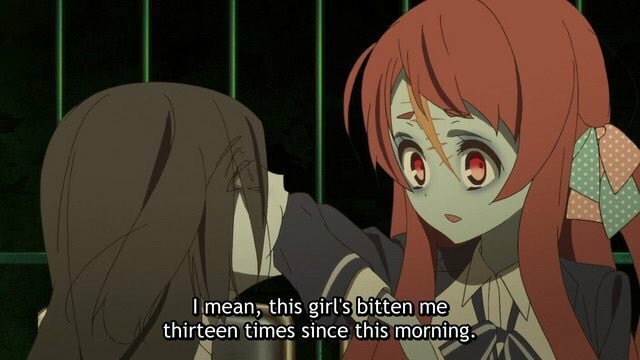 For the record, Zombieland saga is a comedy making fun of/paying homage to the japanese idol industry. No real hunger for flesh in it although there is one girl who hasn't mentally woken up who will playfully bites anything and anyone. "It is a life even after you died running." Now that you mention it, it seems so obvious that the definition is being shouted rather than is shouting itself. I see, and I do like that phrasing. Thank you. Okay I will keep it that way, though I think I will translate に as "at" instead of "to" and maybe add parenthesis for the implied "your." It is the rebellion's chance to succed that shines in the rift between the clouds." I definitely like that translation better! I see. I thought it was contrasting the two. That said, I don't even remember how I got "purpose" as a definition of jiyuu. I see. That make sense and I will follow your suggestion. "Losing Heart know the end" or "Know the end, Losing Heart" Both sounded awkward so I rearranged it to "know the end of losing heart." But I guess that completely changed the grammar. Adding the だ helps immensely. "Know that losing heart is the end." I will make that change. That does make sense in the context of the song. I will do that. Thank you as always! I greatly appreciate all your input and time! EDIT: And with these changes you think this is good to submit? Last edited by Lost247365; 12-22-2018 at 06:07 AM. Yes, I think this is good now.